Are Thornburg or Brasier a Possible Bullpen Answer? For the entirety of 2018 many a sports writer, talking head on TV, Red Sox fan, town crier and keyboard warrior have been discussing what bullpen arm the Boston Red Sox should go after at the trade deadline. 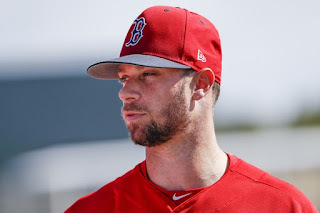 I mean sure, it’s mixed in with some speculation of a new third baseman (for the record, I already spoke a little on that) or utility right handed hitter (see Pearce, Steve) but for the most part the big message is how The Sox can get better after the starter and before the closer. Now, there is no reason that Dombrowski won't make a trade for a good late inning arm to go along with the usual Joe Kelly or Matt Barnes call (by the way, it’s worth mentioning that Barnes is currently 4th in MLB with 20 Holds, but that’s a topic for another day). Like I said, It’s all but predicted that there will be a trade for someone who can step in and fill the 7-8th inning void that so many teams want to bridge. But, perhaps the answer is a little more familiar than a trade candidate. Ryan Brasier has been excellent in his appearances and we might finally be seeing what Tyler Thornburg can do. Admittedly, they may only have a few inning each under their belt, there is reason to hope and wonder if there is a diamond in the rough between these relievers. Of the two, Thornburg is the bigger question mark. He hasn’t pitched in the big leagues since 2016 after undergoing treatment for Thoracic Outlet Syndrome and in his 3 games so far he has only looked truly comfortable in his latest. But in that game his fastball topped out at 95.5 MPH and he threw 28 pitches, the most of his Red Sox career. Additionally it is worth remembering that Thornburg was a dominant arm in 2016. Among qualified relievers his 2.15 ERA had him in the top 20 and that’s including closers. Ryan Brasier, on the other hand, could be the poster boy for several sport cliches. he has 4 innings in 3 appearances and has yet to give up a run or even a hit, making him prototypical of a “hot start.” but he is also a "career journeyman" who had Tommy Johns back in 2014 and took a long time to come back. By the way, his "come back kid" story included playing last season in Japan so I think it’s safe to say he really wants this. Between the two there is a lot to wonder about effectiveness over the long haul as they have very small sample sizes but what has been seen, is promising. So while there is a high chance of getting a late inning arm from San Diego or Miami or somewhere similar, I am still interested to see what there could be in our two comeback kids.